​​​HOUSTON - Houston’s retail market continues to expands with 3.9 million sf under construction. Houston ranks first in construction activity when compared to other U.S. markets. Northern New Jersey was second with 3.7 million sf and Dallas-Fort Worth third with 3.5 million sf. 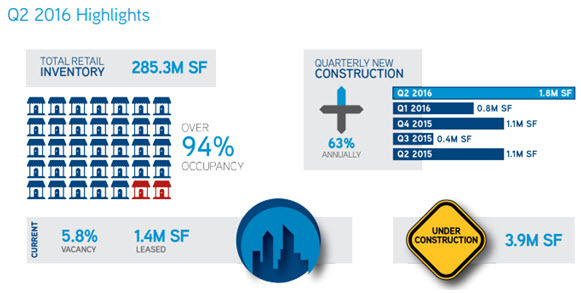 Approximately 82.6 percent of the 3.9 million sf of retail space under construction at the close of second quarter 2016 is preleased. Despite the 1.8 million sf of new inventory delivered in 2Q 2016, Houston’s average retail vacancy rate remained under 6.0 percent, decreasing to 5.8 percent over the quarter from 5.9 percent in 1Q 2016. ​See full report Houston Retail Report 2Q 2016 (PDF). Also check out Houston Retail Market Research for more sources.